Lighting A Revolution: Ink Blotter 213, "...All that lies beyond the Socket." "...All that lies beyond the Socket." 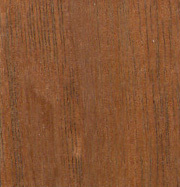 Blotter number 213; image number: LAR_B213. Most of All that lies beyond the Socket." Electric lighting involves more than just a light bulb. Thomas Edison, George Westinghouse and their contemporaries sold systems, not just lamps, and these systems were not necessarily compatible. Edison developed a direct current (DC) system that operated at 120 volts. Westinghouse pushed an alternating current (AC) system. Thomson-Houston Company sold both AC and DC, but their incandescent lamps operated at 52 volts. Each of these systems' lamps had different bases and would not physically fit into the others' sockets. Though all were quick to design adapters. More importantly, considerable research went into the generation and transmission technologies that supported each system. Companies like General Electric and Westinghouse that offered a complete line of electrical products could call attention to that work in their lamp advertising. 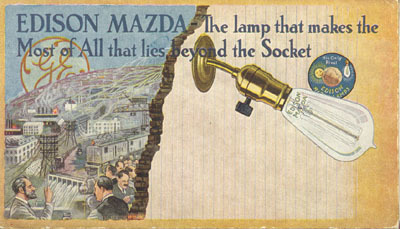 This blotter for Edison Mazda lamps shows, among other things, a hydroelectric plant, transmission lines, an electric locomotive and a laboratory researcher. The sales-pitch implies that this lamp benefits in quality due to the many resources available to GE, resources that smaller competitors with limited product lines lacked. Notice that the Sun's Rival logo has shrunk and moved behind the lamp, while the GE script logo appears over the horizon in the manner of the Sun in the older ads. Edison's name still appears (three times) but his face is nowhere to be seen.